I have to admit (and I have no shame in the matter) but I am obsessed with the Kardashians. Keeping up with the Kardashians, Khloe and Lamar, Kourtney and Khloe take Miami, Kourtney and Kim take New York, I watch them all!!! Now since the promo images for this was released on (I’m sure) Khloe's Blog I have been wanting to order some of their shades from USA- a) cause I love opi and b) it’s the Kardashians. However the pictures of the shades have been digitally created. Low and behold random sale searching on ASOS what did I happen to come across- oh yes we have a UK stockist of the shades for £8 a bottle. However the only colour swatches which ASOS have on are the rubbish digital shots, so cue a quick google search for some swatches. Top Row (left to right)- Khloe had a little Lam Lam, Sealed with a Kris, Listen to your momager, My empire my rules, Hard Kourt fashionista. Middle Row (left to right)- Kourt is redy for a pedi, All Kendalled up, Its all about the glam, Kimpletley in love, Wear something Sparkylie. Bottom Row (left to right)- Follow me on glitter, Kendall on the Katwalk, Disco dolls, Rainbow in the skylie, Khloe had a little Lam Lam (dupe). 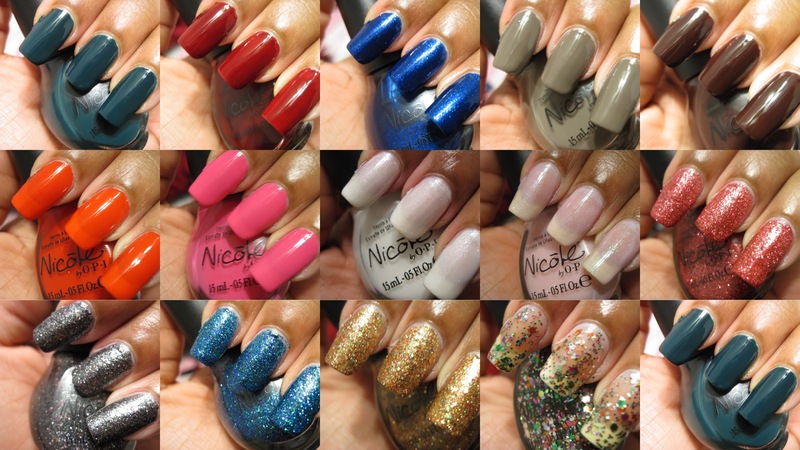 Does Rainbow in the Skylie look a little familiar to another OPI glitter polish?? Thinking Muppets collection...yes Rainbow Connection and for £4 cheaper. Favourite colours have to be Wear something sparkylie and Sealed with a Kris. Hard Kourt fashionista looks very similiar to the colour shellac I have on my nails at the moment (post to come soon). Love the nails collection!!!! I love the Kardashians even though I find kind a bit boring at times. My fav is Kourtney, she is the cutest of all. Gorgeous colours. Khloie had a little lam and wear something Sparkylie are gorgeous. Never used Opi...may be about time! Never even watched the Kardashians tho...yes I may live under a rock!